Modernization is not just a term anymore, but a reality, especially when we talk about a typical Indian kitchen. Age old refrigerators, ovens, and jaffle makers are moving to make space for the more modern kitchen appliances like the electric kettle. Much as it was used for solely boiling water in fancy hotels to make tea or coffee, today, the simple-looking water-boiling small electric kettle can be a housewife’s second hand in accomplishing things that she may ever imagine. Here’s a quick look at the things the kettle can be used for, for making the family happy and the housewife happier. - A boon for new mothers, the electric water kettle can help warm the milk or water bottle way sooner than the stove method. Simply pour in hot water in a bigger bowl and immerse the bottle for some time to reach the ideal temperature, and voila… your have food ready for your little one. You can also use it to make milk or baby food from powder/formula. - Being a housewife means that you have pressure every morning to serve breakfast on time and pack lunch boxes for your husband or children. While the stove is occupied preparing lunch, you can hard boil an egg for breakfast in the electric hot water kettle, that too way faster. You can also use this available hot water to make instant oats porridge. - Once you are done with the morning chores, don’t you want a quick cup of hot coffee to unwind? Your cordless electric kettle can help you get one without fretting. Pour some of that instant hot water in the cup, mix in the coffee, some sugar, and few spoonful of milk, sit back and enjoy. - Homemakers often ignore themselves in the process of taking care of their family and home. Not anymore with the electric kettle! The plain looking electric tea kettle can provide you with hot water almost in 2-3 minutes for your pedicure, or for steaming your facial skin. It’s time for you to sit back and enjoy! - Lastly, the electric kettle can be used by your grown children in your absence to make some coffee, hot chocolate, instant noodles, or even some soup. This way you won’t have to worry about their hunger while you wind up your work or simply relax with your friends. Speedy, energy efficient, and multi-purpose, the electric kettle can be of great use every day. 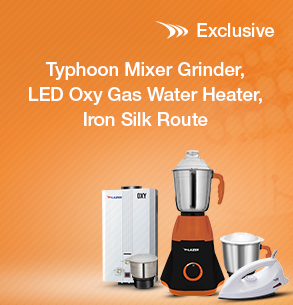 If you haven’t purchased one already then you must buy an electric kettle online right away!